In chapter 12 of his first letter to the Corinthian church, the apostle Paul writes that we are “the Body of Christ, and members individually” (vs. 27). He explains this concept in detail when he describes our differences of ministries and activities but that the same God gives ability to all for our particular service (vs. 6). Consider your own body. Your liver looks and operates very differently from your pancreas or your stomach. A person has only one body, but it has many parts that still make up just one body. The Body of Christ is like that too (vs. 12). If the whole body were an eye, it would not be able to hear. If the whole body were an ear, it would not be able to smell anything (vs. 17). The eye cannot say to the hand, “I have no need of you,” nor again the head to the feet, “I have no need of you” (vs. 21). God’s purpose is that the body should not be divided but rather that all of its parts should feel the same concern for each other (vs. 25). So, Church, how are we doing with that concern for each other these days? Aren’t we still in the mode of believing “We’re right; they’re wrong!” as we look at other Christian denominations or at other congregations within our own denomination, or even at those members of our own local congregation? As a result of being so very mindful of their differences, flaws or “errors,” we often distance ourselves from other members of the body. Why not? What would be wrong with that? Well, for one thing, Paul tells us that God has equipped us with ministry gifts “to prepare all God’s people for the work of Christian service, in order to build up the body of Christ. And so we shall all come together to that oneness in our faith and in our knowledge of the Son of God; we shall become mature people, reaching to the very height of Christ’s full stature.” (Ephesians 4:12-13 GNB). The body of Christ must – must – change its perspective. Where any Christians believe and walk in what we consider to be doctrinal error, we must pray for them. We can’t just turn our backs on them and ignore their problem. Just as we shouldn’t cut off our left hand because it operates with an opposite perspective to our right hand, we shouldn’t reject others because their beliefs or their personal habits differ from ours. I have a friend who believes, as many others do, in a pre-tribulation rapture from her reading of scripture. When she views today’s news reports, she comments that we must be very close to the end of the age and has withdrawn from all responsibilities as a citizen (she no longer votes in elections) as she awaits her rapture off the planet. Her life decisions revolve around that perspective. I’ve pointed out to my friend the many thousands of persecuted Christians in foreign lands who are suffering great tribulation – even to the point of death. If they ever believed in a pre-trib rapture, I’m sure they don’t believe in it anymore. My friend, however, still holds her view which appears to me as wishful thinking. Even though I would prefer to be lifted off Earth before any tribulation occurs, I no longer see the end times the way she does. Rather, I understand it from the perspective of Daniel 2:28-45 where Daniel interprets Nebuchadnezzar’s prophetic dream. Here Daniel describes the major eras of governmental rule over time and declares that at the end of these eras, a stone that is cut out without human hands will strike these governments and they will disintegrate and blow away. In spite of any suffering the Body of Christ might endure, that stone, representing the kingdom of God, will grow and become a great mountain that will fill the earth and will stand forever. Which one of us is right? Should we let our differences divide us? My friend and I have agreed to disagree and not let it come between us. Her life is focused on being raptured into Heaven any day now – maybe even today, so she is not actively involved in planning for the future. Mine is focused on long-term planning while continuing to minister and serve whenever possible among both Christian relationships and to unbelievers. It certainly would be easier to flow in relationship with those who have the same perspective and doctrines and who live life the way I do. But I don’t think I have ever encountered a brother or sister in Christ who believes exactly as I believe about biblical truths. I sometimes long for a relationship with other believers where there is perfect agreement, but I don’t think that will happen this side of Heaven. Paul seems to concur in 1 Corinthians 13 that this is true. Here he appeals to believers to base their relationships not upon doctrines or spiritual gifts, but upon love. We can agree to disagree on doctrinal differences and still love one another as Christ loved us and gave himself up for us – a sweet-smelling offering and sacrifice to God (Ephesians 5:2). Christians must see themselves as members of Christ’s world-wide body across denominational lines. As convinced as we may be that our doctrinal perspectives and practices are correct, we won’t really know for certain till we are with the Lord when this life is over. In the late 1960’s, my husband and I were part of a house church led by a couple with whom we still are closely related. They had invited a traveling minister to teach at our group one evening. Then I got a picture of myself holding up truths in my open hand and the Lord was reaching down and adjusting them with His fingers. It is still sometimes a challenge to hold what I consider settled doctrines in an open-handed way rather than grasping them tightly in a closed fist. We don’t always recognize when we are doing this, but doctrinal rigidity is the core of exclusive denominationalism and pride that blocks loving unity in the Body of Christ. As Paul said, “knowledge puffs up, but love builds up” (1 Corinthians 8:1). Have you ever wondered why God inspired Paul to describe the whole company of believers as the Body of Christ? Certainly that speaks of unity and caring for one another, but it also speaks of functioning. When part of our own physical body is ailing or becomes weak, as well as praying for God’s healing, we often consult a health practitioner who may advise us to exercise more or change our diet, take vitamins, etc. If any part of our physical body ceases functioning, we might end up in the emergency room or worse, in the morgue. Similarly, we do see many members of Christ’s body in a sickly state of spiritual health whose usual function as Christians is to walk into a building, sit down on a seat, sing along with a worship team, stand, sit down, listen to a speaker, put some money in the basket being passed, smile and shake hands with a few people as they are leaving, and drive home. I wouldn’t describe that level of Christianity as active participation. Yet much of Christianity commonly operates in that way and nothing more. What are these works that Jesus said believers in Him (That’s me! That’s you!) will do? That certainly goes beyond average believers who do little more than pew-sitting, with maybe a bit of service thrown in like parking cars or taking up the collection. There are many reasons behind this condition of spiritually limited, rather than spiritually empowered activity in members of Christ’s body. Many pastors accept their denominations assumption that the miracles, signs and wonders Jesus did were to validate His teachings and position as Messiah. In some denominations, one major reason for spiritual limitation is their belief that Jesus’ promise in Mark 16 was intended to end when the last of the original 12 apostles died. Further, many believe the cessationist doctrine that ties these miraculous acts to the 12 apostles even though Scripture records two large groups, with 70 and with 120 disciples, who were initially sent out. But there is no scriptural backing for this doctrine, nor is there historical evidence that His promise was restricted in that way. Since the first outpouring of the Holy Spirit in the upper room (Acts 2), there have been periodic waves of faith movements, some small and some large that show the continued power of the Holy Spirit working through believers as Jesus promised. If one impartation of the Holy Spirit was sufficient, why did the risen Jesus, just before He ascended into Heaven, breathe on His disciples and impart the Holy Spirit to them (John 20:21-22) and then tell them to wait in Jerusalem until they were baptized (immersed) in the Holy Spirit (Luke 24:49) – a second and different impartation of the Holy Spirit. In the original Greek, the word “apostle” means sent one – specifically an ambassador of the Gospel. In today’s church life, that could be a missionary or perhaps a visiting overseer in some denominations. “Prophet” in Greek means forth-teller, one who speaks words of Divine inspiration or insight. Evangelists proclaim the Gospel – the good news of salvation through Christ’s blood. This includes all that Jesus accomplished for us through his sufferings and crucifixion: atonement for sin, healing for our bodies and souls, power over all demonic influences, and prosperity to replace poverty. The word for “pastor” used in both Old and New Testaments refers to a shepherd who leads the flock, and the word “teacher” means instructor. So, if we expect ministry to flow only, or mostly, from the work of the apostles, prophets, evangelists, pastors and teachers, then what is left of His work for the rest of us in the Body? Can you see how the Body of Christ is kept feeble and incapacitated by doctrines of demons that tell us we can’t do what Jesus said to do in Mark 16:17-18, or worse, that these works were just for the first century Christians? Where does it ever say that in Scripture? If, through reading God’s Word, or hearing an inspiring teaching or reading a book on Body ministry, we discover that there is more for us to experience and do as members of the Body of Christ, then we must become equipped for that work. When Christians who are hungry to experience more of God in their lives discover this truth on their own, they often independently seek out seminars and conferences, books and courses that help them to identify their spiritual gifts and callings and teach them how to recognize when God is inspiring or leading them to do something or to speak an encouraging word to someone. But just think how much more could be accomplished if pastors would begin to lead their congregations in this equipping of God’s people to discover their supernatural gifts and callings and to become fully active in their service to the Lord! Some pastors resist having their congregation explore spiritual gifts of the Holy Spirit because they don’t understand the necessity of what one Bible teacher described as: “E.M.I. – Every Member Involvement” in a healthy maturing Body of Christ. Along with seeking an up-close relationship with the Lord, every member of the Body of Christ needs the nourishment of reading daily from Scripture (especially from the New Testament) and listening for His revelations and insights as He leads us day by day through all our plans and decisions. Above all, our posture before God must be absolute surrender to His will. No holding back anything! Remember that Jesus modeled for us how to relate to the Father and to the Holy Spirit. Jesus not only taught us to pray “Our Father, who art in Heaven…” but Jesus also said He only did what He saw the Father doing (John 5:19) and only spoke what He heard the Father saying (John 12:49-50). This was not merely an interesting side-note. This was actually one of the main purposes of Jesus’ coming to Earth as the “last Adam” (1 Cor. 15:45). Remember how He continually referred to Himself, not as the son of God, but as “the son of man.” For example, in Matthew’s gospel – He said 32 times “son of man”, but only once did He say He was the Son of God. Jesus’ 40-day contention with Satan not only played a necessary part of restoring our position and dominion on the Earth – the dominion that Adam had given over to Satan in the fall, but Jesus was also modeling for us how we too can successfully stand against Satan day after day. When we are totally surrendered to God and when we recognize that we have the Holy Spirit empowering us and imparting wisdom to us as well as holy angels caring for us, we can more effectively put down all the evil notions and limitations that the enemy might throw at us. 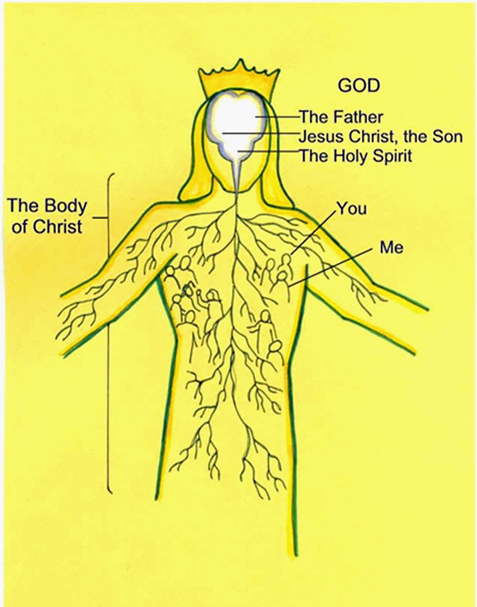 Our individual immersion into the Holy Spirit and receiving His empowerment is essential to the health, strength and unity of the Body of Christ. In fact, the timing of Jesus’ return at the end of the age may be dependent upon the Bride making herself ready in this way. How Can We Make Ourselves Ready as the Bride for the Lord’s Return? What does it look like to be clothed with righteous acts? This description of the Bride of Christ in Revelation 19:7-8 is not referring to our following a set of legal requirements as set out in the Old Testament’s rules and regulations. Rather, this is being motivated by God’s love in all that He directs us to do. If love is a key factor of unity in the Body of Christ, if it is an essential element of my service, leadership, and functioning in Holy Spirit power, signs and wonders, then how am I doing today? We limit ourselves sometimes because of poor self-esteem and sometimes because we don’t understand what the empowering presence of God can do in us to enable us to be all that He created us to be and to do all that He created us to do. God said, “It is not good that man should be alone; I will make him a helper comparable to him.” (Genesis 2:18) Note that the word “helper” is ezer (ay-zer) in Hebrew – the same word that is used 19 out of the 21 times in the Old Testament when referring to God as our helper. When God formed Eve out of the side of the first Adam, she was like Adam in every way but gender. God created man in His own image, in the image of God He created him; male and female He created them. (Genesis 1:27) Adam recognized their oneness when he commented about Eve: “This is now bone of my bones, and flesh of my flesh; she shall be called woman, because she was taken out of man.” (Genesis 2:23). In the same way, Jesus the Messiah who Paul identified in 1 Corinthians 15:45 as the last Adam has a bride who is bone of His bones, and flesh of His flesh because she – the bride, the church – is created from Him. As the Body of Christ, we are one with Him. So what does that imply for our life in Him? Read through the four Gospels about Jesus’ life, His motives, attitudes, moods, words, actions, wisdom and power as He walked through life, and you will see the answer and catch sight of your own readiness as His bride. Look at Jesus, not only His sacrificial love but also His own fusion with the Holy Spirit following John’s water baptism (Luke 3:22). Not only should we believe that God’s promises of spiritual power to the early Christians are available to all of us, but also that as the Bride of Christ, we must prepare ourselves for Jesus’ return, clothing ourselves with love-based righteous acts and power inspired by the Holy Spirit (Rev. 19:7-8). If you ever watch the ocean’s tide comes in, you see that as wave after wave comes ashore, each one recedes before the next wave, but each wave reaches higher and higher up the beach till it is fully high tide. In like manner, there have been incoming waves of Holy Spirit outpourings over the years. We currently are witnessing one of these great worldwide outpourings. See the resources below for more information. I am so grateful to be included as a member of the Body of Christ. I surrender to the influence of your Holy Spirit, so that my heart and mind would be conformed to the image of Christ and that my actions would be truly righteous. I pray for all of us in the Body of Christ as we prepare ourselves to be an appropriate Bride as we wait for Christ’s return. Your name is Holy! May your kingdom come and your will be done on earth as it is in Heaven. Thank you for your abundant provision for us, spiritually and physically especially for your indwelling and empowering Holy Spirit, and thank you for forgiving us for our sins and keeping us safe from the evil one’s enticements. Amen.